Generating ideas is fun – addictive even. I should know. As a design lead, I’ve facilitated many ideation sessions in my career. You’ve probably experienced this, too: a team gets together for a few hours or days to brainstorm ideas. “Go for volume,” they’re instructed. At the end, there may be hundreds of ideas on the workshop room wall. Success is tacitly measured by the number of sticky notes used. But volume of ideas is rarely the problem in most companies. I’ve never come across an organization that doesn’t have enough ideas. In fact, most are swimming in ideas they don’t know how to act on. Yet, we continue to engage in exercises that add more and more ideas to the pile. Part of the problem is an erroneous Darwinistic view of the idea lifecycle. We assume that the best ideas will simply rise to the surface on their own merit. If you can just collect enough ideas, the chances of a few of them surviving will simply increase mathematically. That’s a false hope. The best ideas don’t always win. Instead, natural forces within any organization act to keep ideas down, regardless whether they’re good or not. Chief among these is uncertainty, a leading idea antibody within enterprises. New concepts represent a gamble to risk averse managers, even if they are well-expressed in a high-fidelity prototype. Many ideas seem great at the time we have them. “This is it! We’re going to save the company!” we think with confidence. But when hard decisions need to be made and those innocent ideas hit reality, even the best ones wither quickly. Good ideas are actually the enemy of productivity. A focus on good ideas inflicts terrible damage–operational and emotional–on good managers and good businesses alike. Business ideaholics, not unlike meth addicts and other junkies, are always looking for the next fix. Good ideas overpromise and underdeliver, Schrage contends. They distract our energy away from the “ugly duckling” ideas that could turn into swans, if given the attention. Part of the problem is that we place too much on the face value of ideas. In reality, it’s difficult (if not impossible) to recognize a great idea in its infancy. We assume there will be some “a-ha” moment when everything feels just right. Most innovations come without epiphanies, and when powerful moments do happen, little knowledge is granted for how to find the next one. Even in the myths, Newton had one apple and Archimedes had one Eureka. To focus on the magic moments is to miss the point. The goal isn’t the magic moment: it’s the end results of a useful innovation. Take the Wright Brother’s first flight. There were only a handful of people watching the historic event, and it took them six years to even sell the first airplane. No one saw a multibillion dollar industry stemming from their invention. It’s just hard to recognize a truly great idea in its infancy. Still, we’re obsessed with the origin of ideas. What is the inspiration for having a great idea? How can we tie insights about human needs and desires into ideas? Just look at Steven Johnson’s book, Where Good Ideas Come From, for instance. This is a fantastically detailed look at how ideas get started. He investigates the rise of the most significant innovations of mankind and their origins. …create an open database of hunches, the Web 2.0 version of the traditional suggestion box. A public hunch database makes every passing idea visible to everyone else in the organization, not just management. We should of course be concerned with the natural evolution of ideas and pay attention to where they come from. But that’s not enough. Successful companies are able to convert ideas to delivered value. We need to consider where ideas go to in organizations as much as where they come from. Ideas have a valley of death, as well. Sure, R&D labs protect nascent concepts from the financial forces of the business world. But ultimately a go/no-go decision will be on business viability. Ideas follow a similar path into the valley death, but perhaps at an even quicker rate. In many cases, the lifespan of ideas is only hours. They die in the valley immediately after a brainstorming session. Relying too much on ideas alone asks our business partners to take a leap of faith. Instead we need to prove the market viability of new concepts in a conclusive way. Set the right expectations around ideas. You won’t go from sticky notes the workshop room wall directly to implementation. (I actually had this happen to me on one project). And generating cash flow within a quarter or even a year is also unrealistic. Instead, it may take several years or even decades before ideas come to full fruition as revenue generating products and services. Take the iPod. Contrary to popular belief, Apple didn’t invent digital music players. If fact, the first digital music player was created in the early 80s, nearly 20 years prior to the iPod. And the Diamond Rio pre-dates the iPod by several years as the first commercial digital music player. 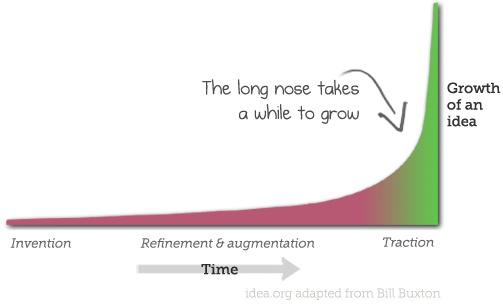 Naturally, organizations strive to shorten the long nose of innovation. It starts with a recognition that thoughts expressed on a sticky note are merely nascent ideas, and there’s a long, long way to go. To be clear: ideation and brainstorming do play an important role in our teams and organizations. They bring people together to creatively envision a future that doesn’t yet exist. There is also engagement on a personal level, strengthening collaboration and bringing teams closer. What’s more, there is also alignment of perspectives around a common cause. Groups form a shared sense of reality by working through problems together creatively. This is all important for the collective health of an organization, and I’m not advocating curtailing these types of activities. The disappointment, however, comes after the fact, when everyone goes back to their “regular work.” The energy and excitement a brainstorming session can quickly fade. The hope of getting a new idea through vanishes instantly. First of all, “workshop amnesia” sets in. Within days workshop participants are asking, “What did we decide?” and “Who owns what?” and “How are we going to find time to do any of this work?”. But also, the momentum needed to get out of the valley of death for ideas is lacking. Remember: there forces working against even you best ideas–uncertainty, short-term financial goals, and lack of resources. Getting new ideas through the normal decision-making gates of an organization involves commitment, time and perseverance. It requires action first in order to build momentum to the point where ideas have a chance. It requires experimentation. Yes, you want valid, comprehensive insights from the market as your starting point. And yes, you need to get the right group of people together to creatively problem solve. But don’t omit planning for a strong follow-through well in advance and have a path to move forward on. Invite a project manager to your ideation or brainstorming session. After participating in the action, their primary function is then to break down the outcomes into actionable steps. Have them create a plan for the continued development of ideas as they emerge. Bringing in project management from the outset shows a recognition of the challenges ahead. It also shows commitment from a broader set of stakeholders in the organization. Idea generation is just the beginning. We believe providing <product/service/feature> will have <benefit> for <customers>. We’ll know this when we see <measurable outcome>. This takes some humility, but sets the right expectations. You won’t go from brainstorming to implementation without proving the business value first (i.e., emerging from the valley of death). Coming out of a brainstorming session with statements that begin with “we believe” shows you don’t know if the idea has legs yet. Experiments let you do that. Ironically, decision makers are attracted to big ideas. They want a home run and are swinging for the fences. “I want the next iPod for the our industry,” they’ll request. There is this glorified notion that big ideas are better. Instead, make a lot of small bets. You don’t know how big an idea will be. Big ideas have less and less chance of getting implemented because the stakes are higher. What’s more, sometimes small ideas morph into a valuable business idea. Get a commitment for continued experimentation in advance, even before you start generating ideas. Line up small teams who’ll have dedicated time to conduct experiments. Clarify the budget in advance as well. A cheap experiment may only take 4-8 weeks to complete and require a budget of a few thousand dollars. Give that team complete autonomy to conduct experiments. The goal is to get real-world feedback and understanding market reactions, business implications, and technical implications at once. Be prepared to re-invent over and over again. After getting real-world feedback, your original idea may not even resemble the initial concept. This need not take much investment. Ask yourself, what’s the shortest possible way to get results about the potential impact of your idea? A simple set of experiment is all that’s needed in most cases– a simple proof of concept that validates your hypothesis or not. For instance, after one workshop I conducted a few years ago, we developed both an explanatory video and a landing page. Visitors could view the video and then sign up to be notified for a beta release. There was a short, three-question survey we introduced after signing up as well. From these touchpoints we were able to measure traffic to the website over a given period of time, the number of sign-ups, and responses to our survey. We also spoke with selected individuals to better understand their motivations and what excited them about our value proposition. “Fake storefront” experiment to collect early feedback and develop ideas. The concept was transformed all along the way. It eventually didn’t resemble its original form. Our great idea turned out to not really be a viable business or stand-alone product. Instead, it was really more suitable as a new capability within an existing flagship product. To reiterate: generating ideas is healthy for any organization. It brings people together and provides a safe forum to exercise creative muscles. But ultimately ideas themselves are overrated. Business decisions don’t get made based on a sketch or half-baked description of a concept. Organizations need a more realistic view of how ideas survive (or don’t). It starts with the recognition that forces will be working against you from the beginning. Avoid the valley of death for ideas. This includes managing outcomes as projects, identifying hypotheses (not concepts for implementation), and following through action. Cheap experiments trump good ideas every time. This takes commitment at all levels of the organization, but the results are much more satisfying than putting too much faith in ideas alone.